I love these animated gifs and wanted to try something like that myself. I did a photoshoot a couple of months ago and used a fog machine to create a misty background. It would be cool to show the mist swirling around in a short animated gif. The original photo had some mist, but I wanted to add some more in Photoshop and then animate it. Level of difficulty: Intermediate. You should be familiar with working with layers, resizing images and using the warp tool. Paint some mist on the blank layer & name the layer Mist 1. 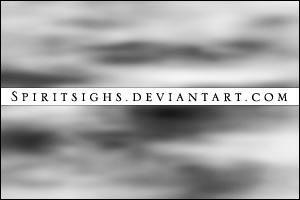 I used these mist brushes by SpiritSighs. Copy the layer, name it Mist 2 and warp it using Edit => Transform => Warp. You can warp the mist to make it look like it has drifted around. Copy the warped layer and repeat with another warp (Mist 3). Copy the above layer and warp it again (Mist 4). You will now have the original image plus four mist layers above it. Click on Fig. 1 to expand. Select the 5 layers and open the animation window (Window => animation - Fig. 2). Make sure you are in frame view (Fig. 3). Click on the frame and duplicate it by dragging it to the new frame icon. Repeat this four times to give a total of 5 frames (Fig. 4 & 5). Click on the first frame. Go to the layers panel and make only the base layer (retouch) visible (Fig. 6). Click on the third frame and make the base layer & the Mist 2 layer visible. Select all 5 frames by clicking on the first and Shift-Clicking on the last one. Change the frame delay time to 0.1 (Fig. 7) You can try different timings depending on what works best for your project. Tween the first and second frames as before. This makes the animation smoothly cycle back to the beginning. Make sure the repeat mode is "Forever"
Check it out - when you press the play button you will have a pretty smooth animation! Resize the image to the size that you want (I used a height of 375 pixels because it gave me a file size under 2 MB). Go to Image => Image Size and select the size that you want, making sure to lock the aspect ratio. Go to File => Save for Web & Devices. To view the animated gif, open it with your browser. I'm looking forward to doing some more of these animations and have lots of ideas for future shoots! If you have tried it, please share by posting a link in the comments section. I am a freelance photographer located in the beautiful city of Vancouver, Canada. I'm passionate about photography and will work with you to get that shot that makes you go "wow!". Anything from portrait to glamour and fashion, and edgy conceptual shoots. I'm open to ideas and love collaborative work. My goal is to get that shot that will blow you away! I am following my passion for photography! After 19 years working in the corporate world as a scientist, approved I made the switch to running my own photography business in 2009. As a kid I was developing my own film and printing my photos, view and later I got more serious with a 35mm camera. I bought my first digital camera in 1999 and love both film and digital today. In 2007, troche I started taking photography courses at Langara College, one of the top photography programs in Canada. I expect to complete the program by the end of the 2010. In this video I show you how I do basic retouching on a beauty portrait, including cleaning up blemishes on the skin, removing stray hairs, brightening up the eyes, retouching lipstick and smoothing the skin using Adobe Lightroom 3.2 and Photoshop CS4. The final image is still very natural looking and does not look like it has been significantly altered. Thanks to model Kaitlin Sullivan and makeup artist Jennifer Ruth! Please feel free to comment and pass along any tips that you might have. I would also be happy to answer any questions on retouching so please ask!